This article is about the American locomotive engineer immortalized in a popular ballad. For other uses, see Casey Jones (disambiguation). Heroic sacrifice for refusal to abandon post to ensure the safety of passengers from an inevitable collision. Jonathan Luther "Casey" Jones (March 14, 1863 – April 30, 1900) from Jackson, Tennessee, was an American railroader who worked for the Illinois Central Railroad (IC). He was killed on April 30, 1900, when his train collided with a stalled freight train near Vaughan, Mississippi. His dramatic death while trying to stop his train and save the lives of his passengers made him a hero; he was immortalized in a popular ballad sung by his friend Wallace Saunders, an African-American engine wiper for the IC. 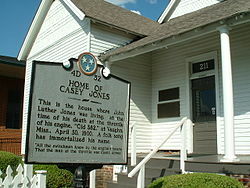 As a boy, he lived near Cayce, Kentucky, where he acquired the nickname of "Cayce", which he chose to spell as "Casey". Jones married Mary Joanna ("Janie") Brady (born 1866), whose father owned the boarding house where Jones was staying. Since she was Catholic, he decided to convert and was baptized on November 11, 1886, at St. Bridget's Catholic Church in Whistler, Alabama, to please her. They were married at St. Mary's Catholic Church in Jackson on November 25, 1886. They bought a house at 211 West Chester Street in Jackson, where they raised their three children. By all accounts he was a devoted family man and teetotaler. Jones went to work for the Mobile & Ohio Railroad, performed well and was promoted to brakeman on the Columbus, Kentucky, to Jackson, Tennessee, route, and then to fireman on the Jackson, Tennessee, to Mobile, Alabama, route. In the summer of 1887, a yellow fever epidemic struck many train crews on the neighboring Illinois Central Railroad (IC), providing an unexpected opportunity for faster promotion of firemen on that line. On March 1, 1888, Jones switched to IC, firing a freight locomotive between Jackson, Tennessee, and Water Valley, Mississippi. He was promoted to engineer, his lifelong goal, on February 23, 1891. Jones reached the pinnacle of the railroad profession as an expert locomotive engineer for IC. Railroading was a talent, and Jones was recognized by his peers as one of the best engineers in the business. He was known for his insistence that he "get her there on the advertised" (time) and that he never "fall down": arrive at his destination behind schedule. He was so punctual, it was said that people set their watches by him. His work in Jackson primarily involved freight service between Jackson and Water Valley, Mississippi. Both locations were busy and important stops for IC, and he developed close ties with them between 1890 and 1900. Jones was also famous for his peculiar skill with the train whistle. His whistle was made of six thin tubes bound together, the shortest being half the length of the longest. Its unique sound involved a long-drawn-out note that began softly, rose and then died away to a whisper, a sound that became his trademark. The sound of it was variously described as "a sort of whippoorwill call," or "like the war cry of a Viking." People living along the IC line between Jackson and Water Valley would turn over in their beds late at night upon hearing it and say "There goes Casey Jones" as he roared by. During the World's Columbian Exposition at Chicago, Illinois, in 1893, IC was charged with providing commuter service for the thousands of visitors to the fairground. A call was sent out for trainmen who wanted to work there. Jones answered it, spending a pleasant summer there with his wife. He shuttled many people from Van Buren Street to Jackson Park during the exposition. It was his first experience as an engineer in passenger service and he liked it. At the fair (also called The Chicago World's Fair), he became acquainted with No. 638, a big new freight engine IC had on display as the latest and greatest technological advancement in trains. It had eight drive wheels and two pilot wheels, a 2-8-0 "Consolidation" type. At the closing of the fair, No. 638 was due to be sent to Water Valley for service in the Jackson District. Jones asked for permission to drive the engine back to Water Valley. His request was approved, and No. 638 ran its first 589 miles (948 km) with Jones at the throttle to Water Valley. Jones liked No. 638 and liked working in the Jackson District because his family was there. They had once moved to Water Valley, but returned to Jackson, which they felt was home. Jones drove the engine until he transferred to Memphis in February 1900. No. 638 stayed in Water Valley. That year he drove the engine that became most closely associated with him, for one time. That was Engine No. 382, known affectionately as "Ole 382. ", or "Cannonball". It was a steam-driven Rogers 4-6-0 "Ten Wheeler" with six drivers, each approximately six feet (1.8 m) high. Bought new in 1898 from the Rogers Locomotive Works, it was a very powerful engine for the time. When a potential disaster arose, all of Jones's skill and the engine's responsiveness were put to the greatest test. His regular fireman on No. 638 was his close friend, John Wesley McKinnie, with whom he worked exclusively from about 1897 until he went to the passenger run out of Memphis. There he worked with his next and last fireman, Simeon T. "Sim" Webb in 1900. A little-known example of Jones's heroic instincts in action is described by his biographer and friend Fred J. Lee in his book Casey Jones: Epic of the American Railroad (1939). He recounts an incident in 1895 as Jones's train approached Michigan City, Mississippi. He had left the cab in charge of fellow engineer Bob Stevenson, who had reduced speed sufficiently for Jones to walk safely out on the running board to oil the relief valves. He advanced from the running board to the steam chest and then to the pilot beam to adjust the spark screen. He had finished well before they arrived at the station, as planned, and was returning to the cab when he noticed a group of small children dart in front of the train some 60 yards (55 m) ahead. All cleared the rails easily except for a little girl who suddenly froze in fear at the sight of the oncoming locomotive. Jones shouted to Stevenson to reverse the train and yelled to the girl to get off the tracks in almost the same breath. Realizing that she was still immobile, he raced to the tip of the pilot or cowcatcher and braced himself on it, reaching out as far as he could to pull the frightened but unharmed girl from the rails. The event was partially spoofed in The Brave Engineer, in which the hero rescued a damsel from a cliché bandit. Jones was an avid baseball fan and watched or participated in the game whenever his schedule allowed. During the 1880s, he had played at Columbus, Kentucky, while he was a cub operator on the M & O. 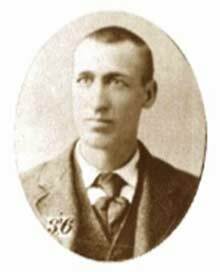 One Sunday during the summer of 1898, the Water Valley shop team was scheduled to play the Jackson shop team and Jones got to haul the team to Jackson for the game. Jones was issued nine citations for rules infractions in his career, with a total of 145 days suspended. But in the year prior to his death, Jones had not been cited for any rules infractions. Railroaders who worked with Jones liked him but admitted that he was a bit of a risk-taker. Unofficially though, the penalties were far more severe for running behind than breaking the rules. He was by all accounts an ambitious engineer, eager to move up the seniority ranks and serve on the better-paying, more prestigious passenger trains. Jones, in February 1900, was transferred from Jackson, Tennessee, to Memphis, Tennessee, for the passenger run between Memphis and Canton, Mississippi. This was one link of a four-train run between Chicago, Illinois, and New Orleans, Louisiana, the so-called "cannonball" passenger run. "Cannonball" was a contemporary term applied to fast mail and fast passenger trains of those days, but it was a generic term for speed service. This run offered the fastest schedules in the history of American railroading. Some veteran engineers doubted the times could be met and some quit. Engineer Willard W. "Bill" Hatfield had transferred from Memphis back to a run out of Water Valley, thus opening up trains No. 2 (north) and No. 3 (south) to another engineer. Jones had to move his family to Memphis and give up working with his close friend John Wesley McKinnie on No. 638, but he thought the change was worth it. Jones would drive Hatfield's Engine No. 384 until the night of his fateful last ride on Engine No. 382. There is disagreement over the circumstances prior to Casey Jones's fatal last run. In the account given in the book Railroad Avenue by Freeman H. Hubbard, which was based on an interview with fireman Sim Webb, he and Casey had been used extra on trains 3 and 2 to cover for engineer Sam Tate, who had marked off ill. They returned to Memphis at 6:25 on the morning of April 29, giving them adequate time to be rested for number 1 that night, which was their regular assigned run. The Fred J. Lee biography Casey Jones contended the men arrived in Memphis on No. 4 at 9 o'clock on the evening of April 29. They were asked to turn right around and take number 1 back to Canton to fill in for Sam Tate, who had marked off. This would have given them little time to rest, as Number 1 was due out at 11:35 pm. In both of these accounts, Jones's regular run was trains 1 and 4. In a third account, trains 3 and 2 were Casey and Sim Webb's regular run, and they were asked to fill in for Sam Tate that night on No. 1, having arrived that morning on No. 2. In any event, they departed Memphis on the fatal run at 12:50 a.m., 75 minutes behind schedule owing to the late arrival of No. 1. A fast engine, a good fireman (Simeon T. Webb would be the train's assigned fireman), and a light train (they had six cars) were ideal for a record-setting run. Although it was raining, steam trains of that era operated best in damp conditions. The weather was quite foggy that night, reducing visibility, and the run was well known for its tricky curves. In the first section of the run, Jones drove from Memphis 100 miles (160 km) south to Grenada, Mississippi, with an intermediate water stop at Sardis, Mississippi (50 miles (80 km) into the run), over a new section of light and shaky rails at speeds up to 80 miles per hour (130 km/h). At Senatobia, Mississippi (40 miles (64 km) into the run), Jones passed through the scene of a prior fatal accident that had occurred the previous November. Jones made his water stop at Sardis and arrived at Grenada for more water, having made up 55 minutes of the 75-minute delay. Jones made up another 15 minutes in the 25-mile (40 km) stretch from Grenada to Winona, Mississippi. The following 30-mile (48 km) stretch (Winona to Durant, Mississippi) had no speed-restricted curves. By the time he got to Durant (155 miles (249 km) into the run), Jones was almost on time. He was quite happy, saying at one point, "Sim, the old girl's got her dancing slippers on tonight!" as he leaned on the Johnson bar. At Durant, he received new orders to take to the siding at Goodman, Mississippi (eight miles (13 km) south of Durant, and 163 miles (262 km) into the run), wait for the No. 2 passenger train to pass, and then continue on to Vaughan. His orders also instructed him to meet passenger train No. 26 at Vaughan (15 miles (24 km) south of Goodman, and 178 miles (286 km) into the run). He was told that No. 26 was a local passenger train in two sections and would be in the siding, so he would have priority over it. Jones pulled out of Goodman only five minutes behind schedule. With 25 miles (40 km) of fast track ahead, Jones likely felt that he had a good chance to make it to Canton by 4:05 am "on the advertised". Unknown to Casey, three separate trains were in the station at Vaughan: double-header freight train No. 83 (located to the north and headed south, which had been delayed due to having two drawbars pulled while at Vaughan) and long freight train No. 72 (located to the south and headed north) were both in the passing track to the east of the main line. As the combined length of the trains was ten cars longer than the length of the east passing track, some of the cars were stopped on the main line. The two sections of northbound local passenger train No. 26 had arrived from Canton earlier, and required a "saw by" for them to get to the "house track" west of the main line. The "saw by" maneuver required that No. 83 back up (onto the main line) to allow No. 72 to move northward and pull its overlapping cars off the main line and onto the east side track from the south switch, thus allowing the two sections of No. 26 to gain access to the west house track. The "saw by", however, left the rear cars of No. 83 overlapping above the north switch and on the main line – right in Jones' path. As workers prepared a second "saw by" to let Jones pass, an air hose broke on No. 72, locking its brakes and leaving the last four cars of No. 83 on the main line. Meanwhile, Jones was almost back on schedule, running at about 75 miles per hour (121 km/h) toward Vaughan, and traveling through a 1.5-mile (2.4 km) left-hand curve that blocked his view. Webb's view from the left side of the train was better, and he was first to see the red lights of the caboose on the main line. "Oh my Lord, there's something on the main line!" he yelled to Jones. Jones quickly yelled back "Jump Sim, jump!" to Webb, who crouched down and jumped from the train, about 300 feet (91 m) before impact, and was knocked unconscious by his fall. The last thing Webb heard as he jumped was the long, piercing scream of the whistle as Jones warned anyone still in the freight train looming ahead. He was only two minutes behind schedule. Jones reversed the throttle and slammed the airbrakes into emergency stop, but "Ole 382" quickly plowed through a wooden caboose, a car load of hay, another of corn, and halfway through a car of timber before leaving the track. He had reduced his speed from about 75 miles per hour (121 km/h) to about 35 miles per hour (56 km/h) when he hit. Because Jones stayed on board to slow the train, he was believed to have saved the passengers from serious injury and death – Jones was the only fatality of the collision. His watch stopped at the time of impact: 3:52 am on April 30, 1900. Popular legend holds that when his body was pulled from the wreckage, his hands still clutched the whistle cord and brake. A stretcher was brought from the baggage car on No. 1, and crewmen of the other trains carried his body to the depot, a 1⁄2 mile (800 m) away. The headlines in the Jackson, Tennessee Sun read: "FATAL WRECK – Engineer Casey Jones, of This City, Killed Near Canton, Miss. – DENSE FOG THE DIRECT CAUSE – Of a Rear End Collision on the Illinois Central. – Fireman and Messenger Injured – Passenger Train Crashed Into a Local Freight Partly on the Siding – Several Cars Demolished." 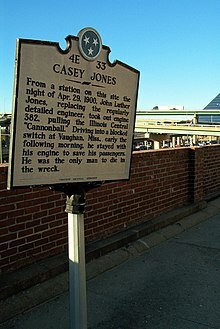 Jones's legend was quickly fueled by headlines such as, "DEAD UNDER HIS CAB: THE SAD END OF ENGINEER CASEY JONES," The Commercial Appeal, Memphis, Tennessee; and "HEROIC ENGINEER – Sticks to his post at cost of life. Railroad Wreck at Vaughan's on Illinois Central Railroad – Terrible Fatality Prevented by Engineer's Loyalty to Duty – A passenger's Story," The Times-Democrat, New Orleans. The passengers did not suffer, and there was no panic. I was jarred a little in my bunk, but when fairly awake the train was stopped and everything was still. Engineer Jones did a wonderful as well as a heroic piece of work, at the cost of his life. The marvel and mystery is how Engineer Jones stopped that train. The railroad men themselves wondered at it and of course the uninitiated could not do less. But stop it he did. In a way that showed his complete mastery of his engine, as well as his sublime heroism. I imagine that the Vaughan wreck will be talked about in roundhouses, lunchrooms and cabooses for the next six months, not alone on the Illinois Central, but many other roads in Mississippi and Louisiana. The next morning Jones's body was transported on the long trip home to Jackson, Tennessee on passenger train No. 26. On the following day, the funeral service was held in St. Mary's Church, where he and Janie Brady had married fourteen years before. He was buried in Mount Calvary Cemetery. Fifteen enginemen rode 118 miles (190 km) from Water Valley to pay their last respects, which was a record. A conductor's report filed five hours after the accident stated, "Engineer on No.1 failed to answer flagman who was out proper distance. It is supposed he did not see the flag." This was the position the IC held in its official reports. The final IC accident report was released on July 13, 1900, by A.S. Sullivan, the General Superintendent of IC. It stated that "Engineer Jones was solely responsible having disregarded the signals given by Flagman Newberry." John M. Newberry was the flagman on the southbound No. 83 that Jones hit. According to the report, he had gone out a distance of 3,000 feet (910 m), where he had placed warning torpedoes on the rail. He continued north a further distance of 500 to 800 feet (150 to 240 m), where he stood and gave signals to Jones's train No.1. Historians and the press had questions about the official findings. In the report Fireman Sim Webb states that he heard the torpedo explode, then went to the gangway on the engineer's side and saw the flagman with the red and white lights standing alongside the tracks. Going to the fireman's side, he saw the markers of the caboose of No. 83 and yelled to Jones. But it would have been impossible for him to have seen the flagman if the flagman had been positioned 500–800 feet (150–240 m) before the torpedoes as the report says he was. In any event, some railroad historians have disputed the official account over the years, finding it difficult if not impossible to believe that an engineer of Jones's experience would have ignored a flagman and fusees (flares) and torpedoes exploded on the rail to alert him to danger. Contrary to what the report claimed, shortly after the accident and until his death Webb maintained, "We saw no flagman or fusees, we heard no torpedoes. Without any warning we plowed into that caboose." An update indicated an additional $327.50 in property damage ($102.50 in track damage, $100.00 for freight, and $125.00 in wrecking expense) plus a settlement of $1.00 to Mrs. Breaux for her injuries. Mrs. Deto was identified as the spouse of an IC engineer, and in the update her claim for injuries was still unsettled. There are no clearly authentic photographs of the famous wreck in existence. There has been some controversy about exactly how Jones died. Massena Jones, (former postmaster of Vaughan and director of the now-closed museum there), said "When they found Jones, according to Uncle Will Madison (a section hand who helped remove Jones's body from the wreckage), he had a splinter of wood driven through his head. Now this is contrary to most of the stories, some of which say he had a bolt through his neck, some say he was crushed, some say he was scalded to death." For at least ten years after the wreck, the imprint of Jones's engine was clearly visible in the embankment on the east side of the tracks about two-tenths of a mile north of Tucker's Creek, which is where the marker was located. The imprint of the headlight, boiler and the spokes of the wheels could be seen and people would ride up on handcars to view the traces of the famous wreck. Corn that was scattered by the wreck grew for years afterward in the surrounding fields. The wrecked 382 was brought to the Water Valley shop and rebuilt "just as it had come from the Rogers Locomotive Works in 1898," according to Bruce Gurner. It was soon back in service on the same run with Engineer Harry A. "Dad" Norton in charge—but bad luck seemed to follow it. During its 37 years of service, "Ole 382" was involved in accidents that took 6 lives before it was retired in July 1935. During its career, the 382 was renumbered 212, 2012, and 5012. January 1903: criminal train wreckers caused 382 to wreck, nearly demolishing the locomotive. Norton's legs were broken and he was badly scalded. His fireman died 3 days later. September 1905: Norton and the 382 turned over in the Memphis South Yards. This time, however, the train was moving slowly and Norton was uninjured. January 22, 1912: 382 (now numbered 2012) was involved in a wreck that killed four prominent railroad men and injured several others. It is called the Kinmundy Wreck as it happened near Kinmundy, Illinois. An engineer by the name of Strude was driving. Jones's beloved Engine No. 638 was sold to the Mexican government in 1921 and still ran there in the 1940s. Jones's African-American fireman Simeon T. Webb (born May 12, 1874), died in Memphis on July 13, 1957, at age 83. Jones's wife, Janie Brady Jones (born October 29, 1866), died on November 21, 1958 in Jackson at age 92. At the time of Jones' death at age 37, his son Charles was 12, his daughter Helen was 10 and his youngest son John Lloyd (known as "Casey Junior") was 4. Jones's wife received $3,000 in insurance payments (Jones was "doubleheading" as a member of two unions, the Brotherhood of Locomotive Firemen and the Brotherhood of Locomotive Engineers, and had a $1,500 policy with each union) and later settled with IC for an additional $2,650 (Earl Brewer, a Water Valley attorney who would later serve as Governor of Mississippi, represented her in the settlement). Other than these payments Mrs. Jones received nothing as a result of the wreck or Jones's service with the railroad, as the Railroad Retirement Fund was not established until 1937. Jones's wife said she never had any thought of remarrying. She wore black nearly every day for the rest of her life. Jones's tombstone in Jackson's Mount Calvary Cemetery gives his birth year as 1864, but according to information his mother wrote in the family Bible, he was born in 1863. The tombstone was donated in 1947 by two out-of-town railroad enthusiasts who accidentally got his birth year wrong. Until then, a simple wooden cross had marked his grave. Casey Jones's fame can almost certainly be attributed to the traditional song, The Ballad of Casey Jones, also known as "Casey Jones, the Brave Engineer", recorded by, among others, Billy Murray, Mississippi John Hurt, Furry Lewis, Johnny Cash, and played live by the Grateful Dead. Songs titled Casey Jones, usually about the crash or the driver, have been recorded by Vernon Dalhart (Edison Disc recorded June 16, 1925), This Bike Is a Pipe Bomb, Feverfew (Blueboy (band)), Tom Russell, The New Christy Minstrels, Skillet Lickers, and the Grateful Dead. IWW activist Joe Hill wrote and sang a protest song parody of The Ballad of Casey Jones. Casey Jones—the Union Scab portrays Casey Jones as a strikebreaker at Southern Pacific. As his engine is badly in disrepair he crashes from a bridge, dies and goes to Heaven. There St. Peter wants him to break a strike of celestial musicians. The rebellious musicians form a local union and throw Casey down into Hell, where Satan urges him to shovel sulphur in the furnaces. Hill's version of the song was later performed and recorded by Utah Phillips, Pete Seeger and, in Russian, by Leonid Utyosov. "April the 14th" (Part 1) and "Ruination Day" (Part 2) – Gillian Welch from Time (The Revelator) — Casey Jones becomes a simile for another great collision, that of the RMS Titanic, on April 14, 1912. "Casey Jones" – Gibson Bros. from "Big Pine Boogie"
Music City Drum and Bugle Corps 2018 show was called "Hell on Wheels, The Final Journey of Casey Jones" it featured original arrangements by Robert W. Smith, Crazy Train by Ozzie Osbourne, and Hallelujah by Leonard Cohen. A 1927 movie, Casey Jones (1927), starred Ralph Lewis as Casey Jones, Kate Price as his wife, and a young Jason Robards Sr. as Casey Jones, Jr. In his 1975 painting "Sources of Country Music", Thomas Hart Benton chose Casey Jones' fateful Engine No. 382, the "Cannonball", to represent the influence of railroads on Country Music. A traditional blues song honoring Casey Jones was performed by many blues singers over the history, including Furry Lewis and Lum Guffin. A 1938 dramatic play by Robert Ardrey called Casey Jones stars a modernized version of the hero, Casey Jones. It was produced on Broadway with a critically heralded locomotive set-piece by Mordecai Gorelik. In 1950, The Walt Disney Company made a new animated cartoon based on Casey Jones, entitled The Brave Engineer. Casey Jones was a television series loosely based on Jones's legend. It starred Alan Hale, Jr. as Casey Jones; Hale would later become well remembered for his role as "The Skipper" on the TV series Gilligan's Island. Beginning in 1950, Good & Plenty candy began an advertising campaign featuring a cartoon character named "Choo-Choo Charlie," a child railroad engineer who appeared in ads featuring a jingle based on "The Ballad of Casey Jones". Casey Jones is mentioned in Caryl Phillips's stageplay The Shelter (1984). Casey Jones is the vigilante comrade of the Teenage Mutant Ninja Turtles. An episode of The Real Ghostbusters (titled Last Train To Oblivion) (1987) features the ghost of Casey Jones. He abducts Peter Venkman, and always yells at him for more coal. Peter eventually realizes that Jones wants to repeat the journey that killed him, so that he can avoid the collision this time. A PS3 trophy called Casey Jones for the video game inFamous, is awarded for performing a stunt on a train. "Casey Jones" is a cheat in the video game Railroad Tycoon II to instantly destroy all enemy trains. Neil Young's song "Southern Pacific" alludes to the Casey Jones legend by imagining a railroad engineer named "Mr. Jones" who meets a less heroic but in some ways a more tragic fate: when he turns 65 years old, he is compelled into retirement by the railroad company as "company policy." In the Season 5, Episode 3 (2011) of The Big Bang Theory, Leonard asks Sheldon "Rough night, Casey Jones?" when he complains about his experience at a model train shop. In Season 4 episode 15 (entitled "Us") of The Walking Dead, Abraham makes a reference to Casey Jones "... none of us have slept more than a couple hours straight since we all went Casey Jones ..."
In a 1993 episode of Shining Time Station called "Billy's Runaway Train", a play about Casey Jones was done. In an episode of The Simpsons, Casey Jones was mentioned by Mr. Burns' son, Larry; the episode is entitled "Burns Baby Burns". In the 1993 movie The Fugitive, while walking through a crash site involving a prisoner transport bus and a train, Deputy Gerard remarks of the conductor, "I bet he did a Casey Jones." Casey Jones is mentioned in the AC/DC song "What's Next to the Moon", in the lines: "Engineer wishing he was home in bed, dreaming about Casey Jones"
Casey Jones is referenced in the Bad Religion song "Do The Paranoid Style", in the lines: "It's the paranoid style in American politics, Casey Jones you better watch your apocalypse"
In 1997, The Green Bag published a poem by Brainerd Currie, Casey Jones Redivivus, about a man injured in a railroad accident. ^ "Facts About Casey Jones". CaseyJones.com. Archived from the original on November 28, 2012. Retrieved December 26, 2012. ^ Lomax, John A and Lomax, Alan. (1934) American Ballads and Folk Songs. Macmillan., p. 34. ^ Erie Railroad Magazine Vol 24 (April 1928), No 2, pp. 13,44. ^ Lee, Fred J. (2008). Casey Jones: Epic of the American Railroad. Lee Press. ISBN 9781443728928. ^ "Casey Jones' Whistler Museum And Park – Hon. Sonny Callahan (Extension of Remarks – October 14, 1993)". Congressional record. ^ a b c d e f g h i j k l m n o p q r s t u v w x y z "Water Valley Casey Jones Railroad Museum in Water Valley, Mississippi". Archived from the original on March 14, 2008. ^ Jones, Massena F. (1978) The Choo-Choo Stopped at Vaughan. Quail Ridge Press. ^ "Train Wreck". Kinmundy Historical Society. Retrieved October 27, 2017. ^ "Poplar Ave. Station". condrenrails.com. Archived from the original on September 24, 2013. Retrieved October 27, 2017. ^ "Death Comes at 92 to Casey Jones's Widow". The Spokesman-Review. Associated Press. November 22, 1958. p. 14. ^ "Widow of Casey Jones Is Dead at 92: "Haunted" by Ballad of Famed Engineer". The New York Times. November 22, 1958. p. 21. ^ "Thomas Hart Benton". Country Music Hall of Fame and Museum. ^ Brainerd Currie. "Casey Jones Redivivus" (PDF). The Green Bag. Retrieved 2018-06-29. ^ "Abandoned: Vaughan, Mississippi". Preservation in Mississippi. March 7, 2012. Retrieved October 27, 2017.